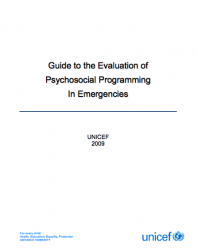 The aim of this manual is to provide basic guidance on psychosocial evaluation that can be used by UNICEF and other organizations conducting psychosocial programs. The guide aims to provide an overview for those designing and managing the implementation of psychosocial evaluations at the field, regional and headquarters level. It does not attempt to give detailed guidance on specific skills or techniques required to conduct psychosocial evaluations, but refers the reader to appropriate guidelines/tools for this information.